Every year, 700,000 median sternotomies are performed in the US alone. A sternotomy is a procedure in which the sternum is cut in two to access the thoracic cavity for surgeries such as heart transplants, coronary artery bypass surgeries, and tumor resections. As the procedure is currently performed, the surgeon manually feels for certain features at the top and sides of the bone to approximate the midline, along which they draw a line. They then manually attempt to follow this line with an electric reciprocating saw as they divide the bone. Once the main surgery is complete, steel wires are wrapped around the bone and tightened to pull the two halves back together for healing. There are many issues that exist with this procedure. If the surgeon deviates from the midline, resulting in a non-linear or asymmetric cut profile, proper healing can be impaired, resulting in issues such as sternal fracture, mechanical instability, and deep sternal wound infection. Moreover, the wire cerclage closure technique can allow the bones to shear, preventing proper healing. 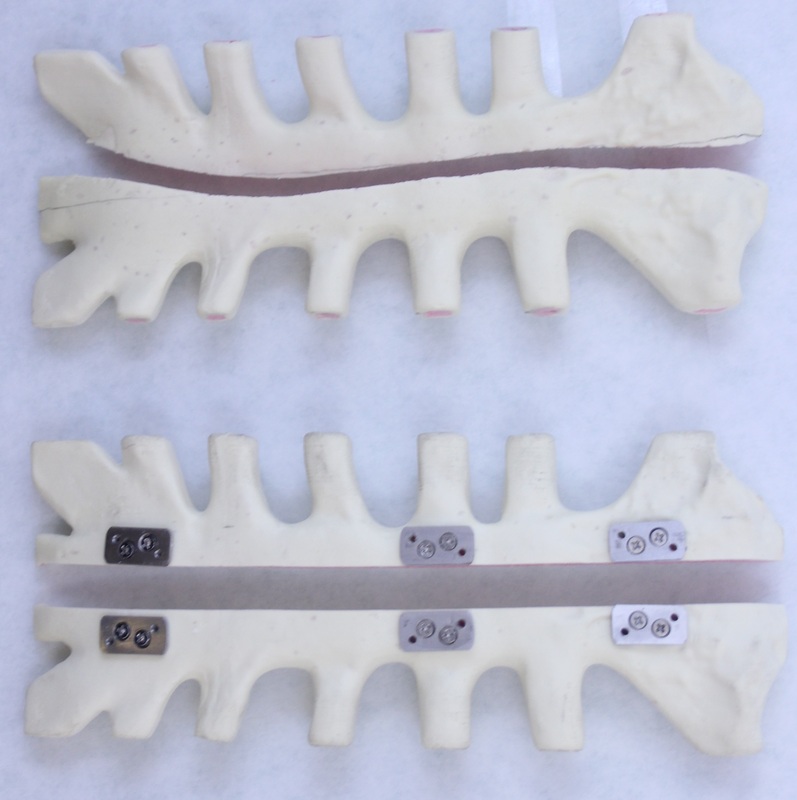 Some commercial attempts have been made to address this later issue through the use of rigid-fixation bone plates that hold the sternal halves together with a metallic plate. That said, no attempts have been made to improve the linearity of the cut or minimize the effect of human error on the procedure. In the fall of 2016, while taking Yale’s MENG 404 Medical Device Design and Innovation class, I worked in a four-person team of students to address this problem, developing a novel sternal saw guide system that aims to mitigate all three of the previously listed issues with sternotomies. The system is comprised of three subsystems—an alignment assembly to accurately locate the sternal midline, a blade guide slot to constrain the motion of the blade and prevent deviations from a linear trajectory, and a rigid-fixation closure system that integrates sternal plates directly into the workflow of the procedure. Over the course of the semester, we worked with Dr. Justin Blasberg and Dr. Tovy Kamine from Yale-New Haven Hospital to develop our concept, starting with initial concept generation, testing various prototypes, and ultimately machining a biocompatible stainless steel prototype. 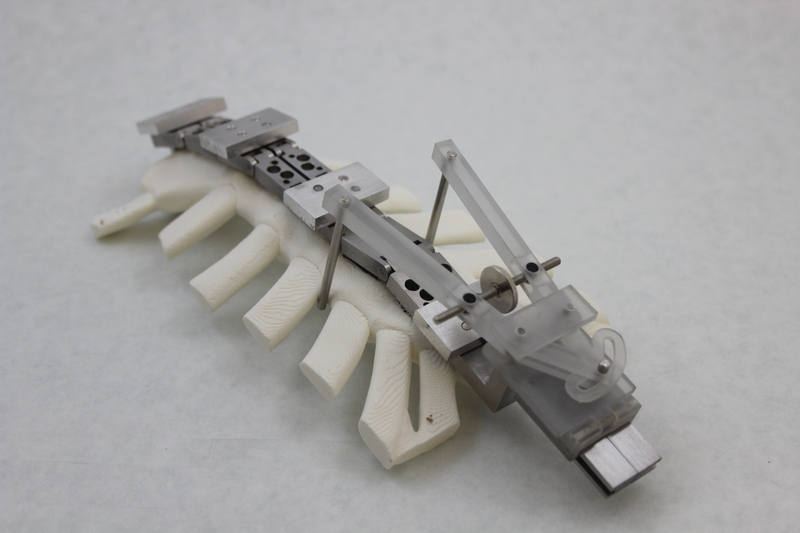 We tested the device on sternal bone substitute models, which mimic the material properties of bone, and were able to observe a clear improvement over the standard free-hand technique. Obviously, we are not trained surgeons, and thus, the quality of our unassisted incision was lower than that obtained by physicians. That said, the fact that we were still able to achieve an accurate, linear incision while using our device—despite our lack of training—demonstrates its robustness.